The DreamFit Bamboo Sheets are certainly an interesting bed set. They currently have a 4.2 star rating on Amazon and a lot of great positive reviews. With that being said, is the thing this company is so proud about really what people want? Let's find out if they are luxury sheets worth your while. The DreamFit Bamboo Sheets are made from a bamboo rayon blend. Bamboo blends are the least eco-friendly, but they are also the most durable. These are bamboo threads that manufacturers combine with other fabrics like cotton, polyester, or flannel. Most of the blends are made using bamboo rayon, which is partly why they are not eco-friendly, but also because the processing for the other material is not eco-friendly either. In this case, the DreamFit Bamboo Sheets are a blend of 70 percent bamboo rayon and 30 percent cotton. This makes these sheets extremely durable, and the 300 thread count with sateen finish makes them very soft. Inside of the bed set, you will find basically what is included in most sets, but with some alterations. With the DreamFit Bamboo Sheets, you'll be getting one extra large flat sheet, their patented fitted sheet, and two pillowcases. I will get into their sheets more in the feature section, but basically, they are able to fit virtually any mattress. While the exact measurements are not provided, they did say that the patented fitted sheet has deep pockets and is able to fit mattresses up to 22 inches thick. That is absolutely insane and the largest we have ever seen here. Basically, if you have a standard mattress, you could use about five mattress toppers and still be fine with these bed sheets. This bamboo bedding is also available in a wide array of mattress sizes. Whatever your size, you can get these sheets for it, from a twin to a split head queen. Of course, they come in a bunch of colors as well. There are four to be exact: blue, white, ecru, and sand. While there are not any outrageous colors available, the ones they have are still nice. This is where we find some really interesting things about the DreamFit Bamboo Sheets. In the section above, I mentioned that they have a patented fitted sheet. This patented product is called DreamFit. It features elastic all around the edges of the fitted sheet, but it does not stop there. On each of the corners, they have elastic bands. The first two corner straps, which are meant to be placed on first, are called FirstFit. These color-coded bands identify which is the head and which is the foot of the bed. The other two bands are called DreamFlex bands, which secure the fitted sheet under the mattress. The sheet is also extra long and wide to ensure that it can fit any mattress you have, up to 22 inches thick. The reasoning behind this is so you do not have to worry about your fitted sheet constantly coming off of your bed during the night. It does not give that drumming effect that some other sheets give, where they are super tight on the mattress. Rather they fit slightly loose, so they have plenty of give. On top of their patented sheets, the DreamFit Bamboo Sheets are also thermal regulating and breathable. 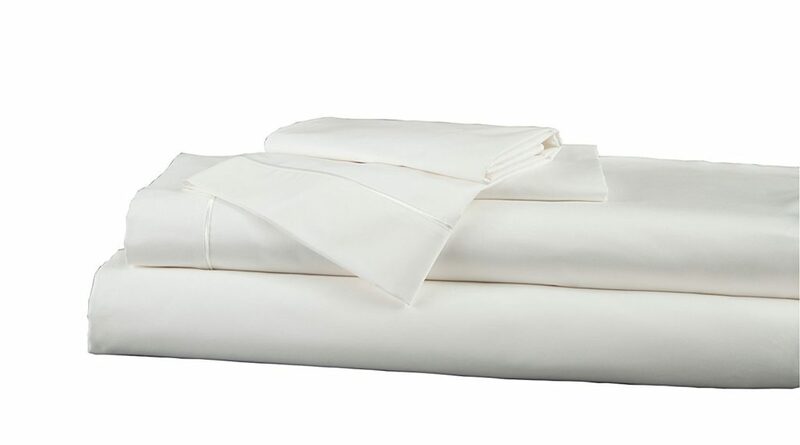 While the breathability of these sheets is lower than a bed set with 100 percent rayon sheets due to the cotton blend, they are still nice and cool. Also, because they are a blend, the care level is far lower than 100 percent bamboo rayon sheets. With these ones, they are machine washable and dryer friendly. You can wash them in the gentle cycle in warm to cool water and tumble dry them and remove them as soon as they are dry. They are resistant to wrinkles, thanks to the cotton blend, so that means less time ironing them out. This company created DreamFit Bamboo Sheets to solve a very specific problem. The problem is bed sheets that do not fit or stay on thicker mattresses. With mattresses getting larger and more involved, bed sheets haven't really changed much. With this problem in mind, DreamFit CEO Jerry Wootten went out to create sheets that are not only guaranteed to fit but also guaranteed to stay on. The company revolves around their patented product, the DreamFit, DreamFlex, and FirstFit. Now, DreamFit manufactures a variety of sheets that are able to fit any bed type. They separate their sheets in six different degrees. They make each degree from a different material, from microfiber all the way to blends. Their blends, Degree 5 and 6, consist of bamboo rayon and cotton for degree 5 and micro TENCEL and SUPIMA cotton for degree 6. The DreamFit Bamboo Sheets are very durable. This is thanks to the blend of 70 percent rayon and 30 percent cotton. Not to mention they are extremely soft as well, with a 300 thread count and a sateen finish. These sheets revolve around their patented technology. The DreamFit, DreamFlex, and FirstFit all make for a pretty convenient fitted sheet. Designed to fit over any mattress, up to a depth of 22 inches, and made so they will not pop off either. This bamboo blend bedding also has the same benefits of other bamboo bedding. They are still breathable, even though they are blended with a thick material like cotton. They are hypoallergenic and give you that cool feeling while you're sleeping. You can grab these sheets for any sized mattress out there. This includes a twin to full XL, and queen to a split head queen, and everything in between. The best part, of course, is that they can fit over any mattress, so using a mattress topper or a mattress protector or three is not an issue at all. While the patented technology does make these sheets very convenient, a few people really did not like it. Many people have complained that the bed sheets are far too large, and they have had to tuck the majority of the sheets under the mattress. Other critical reviews have mentioned something about the poor quality of the sheets. Some have reported the sheets developing rips and tears after washing and such. However, it is unknown if they followed the recommended care for them. These sheets are definitely made for a brand new, pillow top queen or king mattress type bed. Rarely do you find very large mattresses in the twin to full sizes, so these sheets will probably be far too large for those types of beds. However, if you have one of those really nice, new queen or king beds, these sheets should work perfectly. That being said, if you know these are going to be extra large and made to accompany large mattresses and you buy one for a regular sized bed, do not go out and complain that there is too much extra sheet and that they do not fit right. You knew what you were getting and you knew your bed size, so don't play like it is the company's fault. Looking at everything about these sheets, it seems like if you have a bed that would benefit from these sheets, you should be very happy. However, if you have a regular bed, you'll find yourself swimming in sheets. With that in mind, if you want to try them out for yourself, you can grab them on Amazon for $169.99. For any other information on products, including the best bamboo sheets, check out the rest of Green and Growing. Here are some top questions that I found for people seriously considering buying the DreamFit Degree 5 Bamboo Rayon Blend Sheet Set. Is this 100 percent bamboo or a blend? These sheets are 70 percent bamboo viscose and 30 percent cotton. Can you purchase extra pillowcases? Yes, you can purchase them through the company website.